During this last week, Drew, our housemate Andrea, and I endeavored to clean out our bodies a little by doing a juice f(e)ast. Though all three of us eat very healthy food, and have pretty healthy lifestyles, we felt a clean out would be a good idea. Many natural health practitioners recommend an annual cleanse, particularly in the spring. The cleanse entailed descending slowly toward the fast: one day of whole foods, followed by a day of eating only raw foods, followed by three days of only vegetable juice. At the end of the third juice day, we did a liver and gallbladder flush. 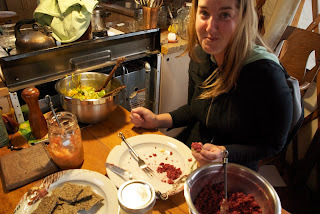 Then, on the way out of the cleanse, we ate mostly raw for a day, then back to whole foods. I can verifiably say that I got clean. It's a funny experience to consciously alter the intake of food, and even to stop eating for a time. It was a very psychological process, one that we all learned a tremendous amount from, about our bodies, about our relationship with food, and about our regular habits. It was a pretty intense cleanse, and we all found that non-essential activities had to be put to the side. It was almost like a vacation. I would recommend it, for those so inclined. To make the juice, as well as some of the raw foods, we used our prized Green Star Juicer. Each day, we consumed about a half gallon of raw vegetable juice each, which included an entire bunch of greens, a cucumber, carrots, beets, celery, and apples. After letting go of my attachment to chewing food, this juice is surprisingly nourishing. I learned about the healing power of raw veggie juice from the Juice Feasting website. Before my friend showed me this site, I couldn't have conceived of only eating juice, even for one day. But the basic concept, as with all types of fasting or cleansing, is to lighten the load on our digestive organs, so that they can work on eliminating their backlog of wastes and toxins. I can say, after going through this process that it really and truly does work. I am inspired by my body's ability to clean itself with a little help from my choices on the outside. There are a lot of great resources on the internet describing cleansing. If you are interested in cleansing, do some research, or consult a natural health care practitioner.